So it's Easter weekend. What does your family do to celebrate Easter? In the past my family has gotten together at my grandparents house, had a huge family dinner then the younger kids had an Easter egg hunt. That was our family tradition for the Holiday...not much Jesus in it except for praying before we eat. This year we don't really have any plans. My grandpa just got out of the hospital, my aunt is having some problems with her kids and my husband and I can't really afford to feed anyone dinner so needless to say we're not doing anything. However, never fear we sure notice what this day is all about. Jesus died. He got beaten and bruised and then brutally murdered for us. He took that pain for us...all of us. 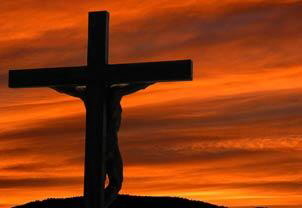 For past present and future sins...He took it for us. God has been working with me about Fatherly love and how much more He loves me than I could ever imagine so I'm starting to get the picture. My husband was reading an article in a magazine about one way to keep Jesus in the Holiday. Instead of doing an Easter egg hunt, this family did a "Jesus Hunt". Instead of eggs they hid items and scriptures that are relevant to the crucifixtion and Jesus's life. When the children go to find these items they bring them back inside and the family discuses all of the items and answers questions that anyone may have. I think this is a really cool idea. It keeps Jesus in the Holiday and it allows the children to ask questions and gives parents an opportunity to talk to their kids about Him. What does your family do for Easter, how do you keep Jesus in this Holiday? I think my family and I will have to start our own family tradition with Jesus for Easter. We begin the day with the Lord's supper, breakfast, and service with our Church family. The afternoon is filled with lunch and hanging out with family! My husband, kids and I always do the resurrection eggs and pray before coloring easter eggs. Then we always have a family dinner and the kids hunt eggs. This year we are doing communion before dinner and for breakfast we are doing resurrection rolls. It is so important to make the holiday about Christ and His sacrifice. I don't want my kids thinking it is about candy or a bunny. I love your idea! My kids are older, but I still want the day to be about Jesus.